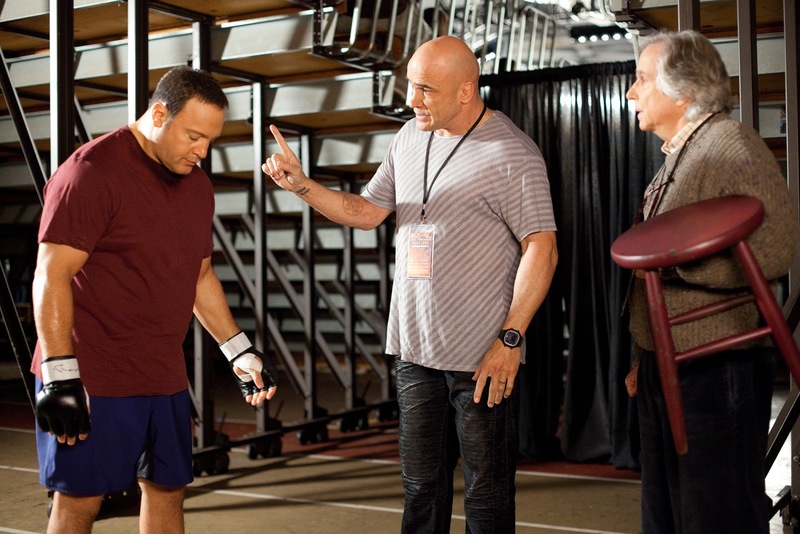 Thanks to Sony Pictures I was able to review the film "Here Comes the Boom" which is in theatres now. I took my two girls and a friend for the review - all between 10 and 11 years of age. "Here Comes the Boom" is about a slack high school teacher, Scott Voss (played by Kevin James) who is floating through his work days. Due to frustration with the system, he has stopped caring about being an educator and is doing the bare minimum to get by. Scott is infatuated with Bella Flores (Salma Hayek), the school nurse, but she is turned off by his lack of motivation and integrity and refuses to go out with him although he asks her out on dates incessantly. When trying to pass off some duties to a fellow teacher, Marty Streb (played by Henry Winkler), he finds himself sympathizing with him and somewhat motivated by his passion. When this Marty's job is in jeopardy, he challenges the school board and then vows to raise money to save the teacher's job. When trying to figure out ways to earn money, Scott comes up with the ludicrous idea to fight in the MMA to raise money. the only problem? He is out of shape, has wrestled but never fought and has no idea what he is doing. Marty seeks out an adult student in his evening class to help him train. With Marty's help, this nutty trio tackles taking on the MMA, and not always successfully. Kevin James brings his usual "screwball guy with a good heart" vibe to Scott's character. Scott Marty shares endless enthusiasm and a positive outlook on life that has a contagious effect on those around him. - Greg Germann whom I recognized from Allie McBeat was a wonderful, cranky Principal Betcher who is well intentioned but uptight, snarky and a constant thorn in Scott's side. - Charice, the energetic and sweet, smiling singer from the Phillipines immerses herself in the role of Malia, a student who is inspired by Scott and who in turn inspires him. - And my favorite? Bas Rutten who plays Niko, a former fighter who is more than somewhat clueless outside the ring but a savant within. His experience as an actual Martial artist shines through. Niko and Marty help Scott achieve some successes... and some failures... within the ring. In the end what Scott wins is much more than he bargained for and much different than he had in mind. If you are opposed to having your kids view violence, this may not be the film for you. My Husband is a MMA fan however so my kids are used to seeing the real deal. They thought this movie was absolutely hysterical. Miss E told me several times how great she thought the movie was. We were all laughing out loud throughout the film and I was sorry that my husband was unable to watch this with us. If you are looking for a feel-good comedy this is a great movie for a few laughs. I know the girls will want to watch this again so I have a strong feeling this will be added to our DVD collection when it comes out! Don't wait until then though - you can catch it on the Big Screen now! Disclosure: I received movie ticket passes for review purposes. I did not receive any monetary compensation nor was I required to write a positive review. All opinions expressed are my own.